Changes in the healthcare marketplace over the past decade have resulted in a wave of hospital consolidations. Academic medical centers (AMCs) have been front and center in this movement, as many have embarked on a strategy of acquiring community hospitals. Mergers of healthcare facilities in general, and of imaging-related facilities specifically, has nearly doubled.1,2 The rationale is multifactorial and includes: a) gaining market dominance, b) enhancing operational efficiencies, c) widening access to services, and d) achieving sufficient size to participate in population health management. Hospitals are evolving from providing high-cost episodic acute care to being participants in a system maintaining population health. The successful integration and expansion of diagnostic imaging services by AMCs into regional networks is, therefore, an important concern when attempting to increase profit while balancing rising costs. In the environment of the Affordable Care Act, hospital systems are under more pressure to provide high quality care.3 In achieving this effort, academic radiology departments (ARDs) can take a wider role in assisting expansion of radiology services to newly acquired community sites and creating integrated health systems. First, medical imaging is now deeply embedded in health care delivery. In many instances diagnostic imaging has replaced the physical examination as a primary means of diagnosis. Second, in many instances minimally invasive image-guided interventions are replacing costlier and more invasive surgical techniques. As a result, the successful integration of medical imaging services by AMCs into regional networks is often a priority during these consolidations. Hospital mergers provide radiologists the opportunity to standardize imaging and improve quality of care across a hospital system. Advances in technology also allow radiology practices the ability to shift workloads across the enterprise to meet imaging demands in time and financially efficient ways. ARDs have a depth of subspecialty expertise that is typically lacking in smaller community based departments. As a result, radiologists in ARDs have an opportunity to play a significant role beyond film reading. They play a crucial role in driving the transformation of the new health care delivery model. This article outlines a sample process used by an ARD to expand services to newly acquired hospitals in order to provide a framework for other systems undergoing similar community integration projects. The process of evaluating the potential expansion of radiology services to a new community hospital (Table 1) begins with a financial assessment. This includes evaluation of the new site’s existing operating revenue and expenses. Extrapolations are then made of the future operating revenue and expenses by assuming a two to four percent increase in examinations per year. Determining the operational needs of the new site begins with evaluating the total number and type of studies that have traditionally been performed at the new site. This process includes projecting how many studies will be read remotely by existing radiologists in the practice and how many will be read by local radiologists stationed at the new community site. Subspecialized examinations should be transferred to the main campus to be read by subspecialists (Table 2). This ensures uniformity and a heightened quality of reads across the entire system. Depending on the current number of studies being read at the main campus and the expected increase in workload with the new site, new specialist radiologists should be recruited. It is important that subspecialty radiologists form a true team. That is to say they jointly participate in protocol development, technologist education and quality assurance and improvement activities. Standardization should be a goal in a truly integrated radiology department. The seamless integration of on-site and off-site radiologists is a top priority in building a regional radiology network. This requires system wide PACS connectivity. Therefore, IT hardware and personnel need to be determined. This can be accomplished by consolidation of technology and implementing the same PACS and dictation software across all sites. A centralized IT department can then adequately handle technologic needs for the entire department, thereby reducing cost of training and personnel and distributing them throughout a system. When deciding how to implement technology across a system, ARDs should attempt to make reading of any study possible from any site. This allows the ARDs to remain flexible as new sites are acquired and meet the needs of a changing hospital network. In the acquisition of a new site, a certain number of radiologists are needed to provide services locally, whether that be diagnostic reads or interventional procedures. The number of radiologists needed varies depending on the anticipated number of examinations that will be read remotely. It is essential to choose the “right” local team as they will represent the face of the practice at that institution. Each facility is unique and requires a tailored solution. Great effort should be taken to fill each position with the right person. At times, radiologists can be hired from the existing radiology group covering the facility. Those radiologists often have the benefit of positive existing relationships with the technical and nursing staff at the new hospital. Hiring new radiologists is another option if no candidates from the existing provider are felt compatible. When hiring new radiologists, the ARDs should look for subspecialty-trained physicians who can provide new additional services that are tailored to the community hospital. For instance, if a newly acquired site has a large orthopedic surgery practice already established, hiring a local musculoskeletal trained radiologist can be extremely valuable and increase business for the department. An active cardiology clinic should encourage the hiring of cardiothoracic trained radiologists. Radiologists with basic interventional experience in particular are of significant value to regional hospitals as many smaller facilities do not have access to imaging-guided procedures. Enabling patients to receive these services locally rather than from a tertiary care referral site allows care providers at the new site to be more inclined to request services and increase business for the radiologist. As stated previously, however, centralization offers uniformity and can reduce costs for certain types of reads. The ARDs should therefore decide which types of studies to centralize and hire radiologists accordingly. 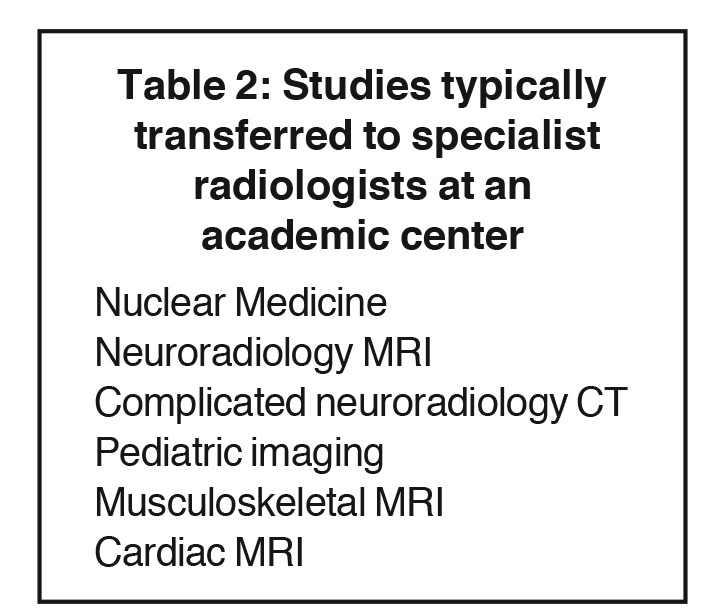 Subspecialties that require a large amount of costly ancillary services, such as nuclear medicine, or that deal with medical services not available at most community sites, such as neuroradiology and pediatrics, are most amenable to centralization. Many institutions have begun developing 24/7 coverage of emergency radiology services enterprise wide. The majority of imaging needs in emergency rooms deal with neurologic issues, such as strokes and intracranial bleeds, or with general medicine, such as acute abdominal pain and shortness of breath. Most radiologists are well trained in emergency radiography during residency and are comfortable with this modality. Radiologists providing ER coverage should be additionally comfortable with chest, abdomen, and brain CT, abdominal ultrasound, and brain and spine MRI as these constitute the majority of imaging studies ordered by an emergency room. Hiring abdominal and neuroradiology trained radiologists allows ARDs to provide these services with higher quality and faster reading compared to general radiology trained staff. ARDs must look at the existing number of overnight emergency examinations performed at a new community site and hire additional staff similar to the expansion of daytime specialty coverage described previously. Centralization is extremely important in providing coverage to the ER. Turnaround time for reads reflects on the quality of the department and allows rapid throughput and increased revenue for the ER and the hospital by enabling a larger amount of patients to be seen in a given time. By using the IT services available at the hospital to send images across the entire network to a single location, the ARDs can provide rapid reading from multiple sites with a smaller staff compared to having radiologists stationed locally at each community emergency center. Having subspecialty radiologists who are comfortable and well trained in the most commonly used imaging from an emergency room can provide quicker and more accurate readings to the ordering providers. Of the many challenges involved in integration of community sites with the main campus, one of the greatest has been standardization across sites. It is essential to have standardized exam protocols throughout the system. There is a growing concern that variability is undesirable. Consistency results in clarity for referring caregivers. It enhances patient safety and quality. Achieving standardization requires a collaborative effort among subspecialty radiologists throughout the practice and the technical leadership at all sites. It is also essential to have standardized reports as that is the final product in the imaging value chain. The development of such standardized reports also requires a collaborative effort among radiologists throughout the practice. Establishing a single quality standard across the health system is essential. It is a means to add value to our service and elevates the core product. To ensure this, metrics should be introduced to track performance. This process can be accomplished in several ways including creating a centralized quality committee that dictates scanning protocols, exam procedures, and other technical factors across all sites. The quality committee members include academic radiologists, community radiologists, and medical physicists to ensure that all equipment across the hospital is standardized and that the differing needs and situations of academic and community sites are addressed fairly. A dashboard should be created for quality reporting. Among the metrics that can be tracked are average length of time to final dictation and peer review data. These can help provide an ongoing measure of how individual radiologists throughout the practice compare. They also allow departments to show value added to a hospital system for non-billable work such as time spent teaching medical students and residents. These dashboards allow an ARD to have physical documentation of value added to a hospital when attempting to negotiate new contracts or keep existing ones. With the transfer of a great number of specialty reads to the main campus, communication to physicians at regional sites became more difficult. This problem was addressed through the implementation of closed-loop communication technology system. An ongoing quality improvement project for the department has involved subscribing all providers in the system with this program so that critical results can be transmitted to ordering physicians in real time via pagers, cell phones, and emails. A record of communication with the clinician is maintained including confirmation of receipt of the message. This system allows clinicians to receive only the critical portions of a radiology report for immediate decision making with the option to review the remainder of the report at a more convenient time. Such a system also allows for mitigation of risk on the part of the ARDs and radiologists by creating legal documentation of such communication. Onsite interventional radiologists are necessary at every community site in order to bolster the business of the radiology department and provide value to the regional hospitals. A primary interventional radiologist (IR) for each regional hospital where IR services are offered is preferred in order to develop a stronger relationship with local clinicians, nursing and technical staff. Depending on the expected workload for intervention at the new site, part time or full time coverage may be required. A challenge to expanding interventional services involves the cost of operating rooms, imaging equipment, and trained radiology technologists. To offload cost, practices can hire radiology and physician assistances as well as nurse practitioners to handle minor procedures that are necessary and allow radiologists the time to perform more complicated procedures or diagnostic reads that provide greater revenues for the hospital and group practice. There are two major threats to the expansion of an academic radiology practice to community sites: the existing radiology group at those sites and non-radiology providers. Existing radiology groups often have contracts to provide radiology services in exclusivity to the hospital at the time of the acquisition. 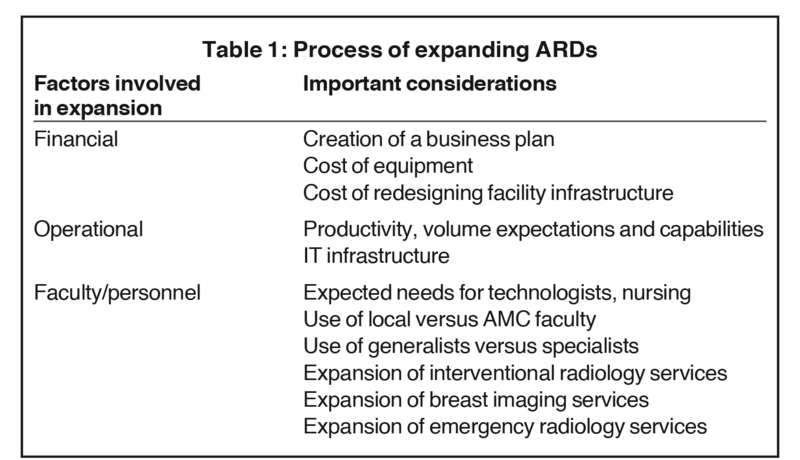 Expansion of the ARD may therefore not occur for months or even years after acquisition, since the acquiring health system typically respects the existing contracts of independent radiology groups. If a local independent radiology group has a strong track record of value and service to the regional hospital, there may be reluctance by the administration to remove the group after its contract expires, because of loyalty by the medical staff of the institution. ARDs must therefore develop a strong relationship with hospital administration to prove value to the institution and show that similar to better care can be provided at a reduced cost. This can often be achieved by highlighting the reduction in costs with improved efficiency across the system, reduction in overhead by centralizing services, and benefit to clinicians and patients by offering unique and subspecialist interpretations and interventions. Nonradiology providers also pose a threat to academic groups by increasing providing more procedural care that was previously performed by interventional radiologists. Nursing staff, for instance, has been able to place peripheral catheters under ultrasound guidance and perform bedside paracentesis and thoracentesis at a fraction of the cost of the same procedure performed by a radiologist (Table 3). 4-6 The reduction in cost with providing these services with non-physician providers makes expansion of interventional radiology difficult. A solution has been to create a team of dedicated nurses and radiology assistants who can perform basic procedures with lower reimbursement rates and have this group fall under the purview of the ARD. By streamlining procedures and creating a dedicated team to perform them, a greater number of procedures can be performed by providers who become extremely experienced. This practice improves patient care and quality, reduces errors, reduces cost, and allows physicians to participate in care that earns the hospital system more money.7 By providing this service and the knowledge of how to implement such a care team under the jurisdiction of the radiology department, an academic group can claim to provide a better value for the hospital and secure contracts to expand services to new networks in favor of non- radiologist providers. As academic medical centers continue to expand their footprint in an effort to bring more patients into the network, radiology services can be tied with the expansion to ensure quality of care and greater business for the radiology department. Academic physician groups must take a front role in this expansion process by establishing strong relationships with administration and proving the value, efficiency, and cost-cutting potentials of integrating community sites with a central academic department. Failure to do so can cause administration to side with regional practices and non-radiology providers when deciding how to provide services for patients in an effort to contain costs. This can contribute to disorganization across a hospital system and poor care for patients as well as reduced revenue opportunities for radiologists. Fleishon HB. Mergers and acquisitions for the radiologist. J Am Coll Radiol. 2008; 5(5):644–651. Porter AT, Lighter D, Flaks J. Intangibles in mergers and acquisitions-a critical success factor in modern day health care. J Oncol Manag. 1998; 7(5):24–25. Carlos RJ, Weinreb JC, Sherry CS, et al. Managing hospital-radiologist relationships: proceedings of the Tenth Annual ACR Forum. J Am Coll Radiol. 2011; 8(2):95–98. Duszak R, Walls DG, Wang JM, et al. Expanding roles of nurse practitioners and physician assistants as providers of nonvascular invasive radiology procedures. J Am Coll Radiol. 2015; 12(3):284–289. Wright DL, Killion JB, Johnston J, et al. RAs increase productivity. Radiol Technol. 2008 ;79(4):365–370. Ellenbogen PH, Hoffman TR, Short BW, et al. The radiologist assistant: What radiologists need to know now. J Am Coll Radiol. 2007;4(7):461–470. Hawkins CM, Bowen MA, Gilliland CA, et al. The impact of nonphysician providers on diagnostic and interventional radiology practices: Regulatory, billing, and compliance perspectives. J Am Coll Radiol. 2015;12(8):776–781. Rahim S, Sivit C, Ros P. Integrating community radiology into academic departments: An overview. Appl Radiol. 2018;47(11):19-22.